Fancy a Bit of Stuffed Peacock? Her Moveable Feast Hits L.A.
Washington D.C. The day is doomed from the start. I sleep too long, the grapefruit juice has fermented overnight, my husband has run out of clean socks. Fate continues to deal lost emails and unreturned phone calls. I should never have considered soufflés for supper as they were bound to collapse. It happens to us all but I’m damned if I’ll submit. Muttering under my breath, I tip the sad little bundles into a baking dish, spoon some cream on top and sprinkle with cheese. I’ve heard of this trick but never tried it. After 10 minutes in the oven, to my relief the soufflés are appetizingly brown and repuffed to acceptable proportions — the day is saved! A surprising number of kitchen disasters can be retrieved by life-saving techniques. Take overwhisked egg whites for instance (the cause of my soufflé contretemps). I left them a moment too long so they separated into dry little curdled clumps. What I should have done was “quick fix” them with another unbeaten white (one for every two overwhisked whites), continuing just until a smooth consistency returned. “Quick fixed” whites act quite normally, but use them at once. I had similar trouble the other day — the cream curdled after I overwhisked it in a hot kitchen (chilling cream, bowl and whisk before you start can help enormously). While the cream is whisking, look out for suddenly rough texture and the yellow tinge which shows the fat is about to separate and form butter. Stop whisking and chill the cream in the freezer for 5 minutes. Stir it as little as possible when using. When cream does curdle, I fix it by taking it all the way to butter: I continue whisking 1-2 minutes until the butter separates in clumps, then I transfer it to a bowl of cold water with a draining spoon and squeeze it with my fist. After a couple more minutes it comes together in a cake. You can add salt at this stage but personally I never do. I have the best butter ever, far sweeter than anything in a packet. Seized chocolate, now that’s a tricky one to fix. One moment you’ll be stirring glistening, unctuously smooth dark chocolate and the next it will have clumped on the spoon to hard granules. The trouble here is to detect the cause. If you’ve just started melting, chances are that a small amount of water or steam has drizzled into the chocolate. The cure is to take it from the heat and stir in a teaspoon or two of tasteless vegetable oil. The chocolate will return to normal, though it will have lost some of its gloss. However if chocolate seizes because it is too hot and the cocoa butter has separated, you cannot reconstitute it. All you can do transform it into chocolate sauce by adding plenty of water or cream. Key proportion is a tablespoon of liquid to two ounces of chocolate — below that the chocolate seizes. But first of all taste the chocolate and if scorched, it is unusable. Scorching is the most intractable kitchen problem — a true catastrophe. First fix is to get rid of the burned portion, either by cutting or scraping it away. On the stove, transfer the food to another pan, taking care not to disturb the scorched part. Cover up the carbon with brisk flavors such as olive, anchovy, chili and, best of all, booze. A shot of whisky or rum can work wonders. However if an oily smoke flavor has penetrated the food, it is impossible to disguise. Oversalting is another matter. Try fixing it by adding an ingredient which is bland by nature such as tomato or mushroom. Dairy products — milk, cream, yogurt, butter — are well-known softeners of too sharp a taste. (If you’re on fire from a hot chili, drink a glass of milk, not water). Potato and other roots soak up salt and you can actually remove salt by cooking chunks of potato in a mixture, then discarding them. Rice or pasta are other possibilities. At a real pinch, to avoid losing expensive ingredients such as shellfish, cook a second batch with no salt at all, then combine the two. –Tasteless? Try salt or lemon juice, or a teaspoonful of sugar for fruits including tomato. –Looks a mess? Chopped parsley or cilantro conceals a multitude of miseries. –Crush potatoes or other overcooked vegetables with generous spoonfuls of crème fraîche or yogurt and a big knob of butter. –Transform overcooked fish into escabeche by topping it with this handy marinade: purée in a food processor l small onion cut into pieces, l peeled garlic clove, the pared zest of l orange and l lemon, a handful of parsley sprigs, 2 teaspoons paprika, a pinch of cayenne, salt and pepper. Add 1/2 cup olive oil and 3 tablespoons red wine vinegar and purée again until smooth. For under- or overdone beef, top with the same escabeche marinade. Your skills in whipping egg whites and cream are tested in this deliciously light savory version of the famous French dessert. Look for fresh goat cheese, the softer the better, and serve the coeur with leaves of endive, thin slices of fresh fennel, your favorite vegetable crudités, or simply with unsalted crackers. If you don’t have one of the special heart-shaped “coeur” molds, use a closely-woved basket lined with a double layer of cheeseloth. 1. Dampen the cheesecloth and line the molds with it, pressing it well into the corners and letting excess drape over the sides. Set the molds on a tray. Chop the chives, reserving 16 stems for decoration. If necessary, beat the cheese with a few tablespoons of the cream until it falls easily from the spoon. Stir in the chopped chives, salt, pepper, and the garlic if using. 2. Whisk the egg whites with a pinch of cream of tartar until stiff. 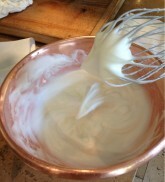 Whisk the remaining cream until it forms soft peaks. Fold together the whipped cream and egg whites, then fold them into the softened cheese. Taste and adjust the seasoning. Fill the molds, pushing the mixture well into the corners, and tap each one on the work surface to eliminate any air bubbles. Wrap the mixture in the draped cheesecloth, set the molds on a tray and refrigerate until well drained and firm, at least 6 hours, or overnight. 3. To serve: unmold the cœurs onto individual plates and decorate with a cross of chives. Serve chilled for 8.